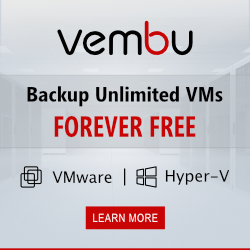 A quick post to let you know about an interesting offer from Veeam which may allow you to dip your toe in with cloud based backups. Good backup policy follows the 3-2-1 rule, 3 copies of your data, on 2 different media and 1 stored offsite. Veeam offers a service with their Cloud Connect option to store backups and replicas in the cloud. This allows the meeting of the rules concerning keeping one copy of your data off site and two types of media with cloud and onsite storage. Veeam are offering an incentive of $1000 worth of credit towards Cloud Connect, the offer is available until the end of June. You can see the steps to getting the free access below. You can see further details here. You might also enjoy this other Veeam article.